In early July we traveled to Arizona as part of a project we started, "Justicia y Dignidad", to work deepen the connections we have to three grassroots community organizations. We visited with No More Deaths, Tierra y Libertad Organization in Tucson and Puente Movement in Phoenix in order to deepen these collaborations and work more intentionally on art projects that support the work they do in their communities. To support the groups we are doing what we do best, creating artwork to support the campaigns they are running. We will design two posters for each organization producing offset and screen printed versions of the posters. We are also providing a series of workshops and skill shares for members and organizers. 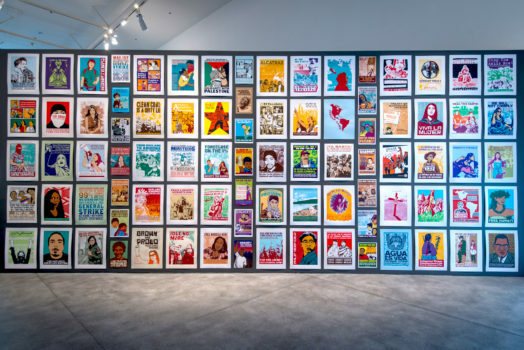 Our goal is to teach the organizations how we approach screen printing, stenciling, poster layout and photography as well as showcasing the work, through exhibition, that comes out of this collaboration. This was the first of three trips that we will make to Arizona and we hope that through these visits we will be able to better understand the issues impacting people there and to build a closer relationship with the organizations and their members who are working to improve the conditions of their communities. We decided to start this project because like many others we are concerned with the racist climate in Arizona and feel that the best way we can help is by using our skills as artists to contribute to the struggle for human rights. 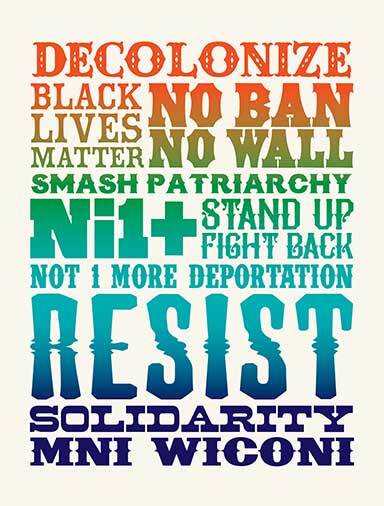 As cultural workers we believe that our artwork can be an empowering reflection of community struggles, dreams and visions and that working with organizations who are working in the most affected communities we show our solidarity bin the fight against white supremacy and most importantly for dignity and justice. 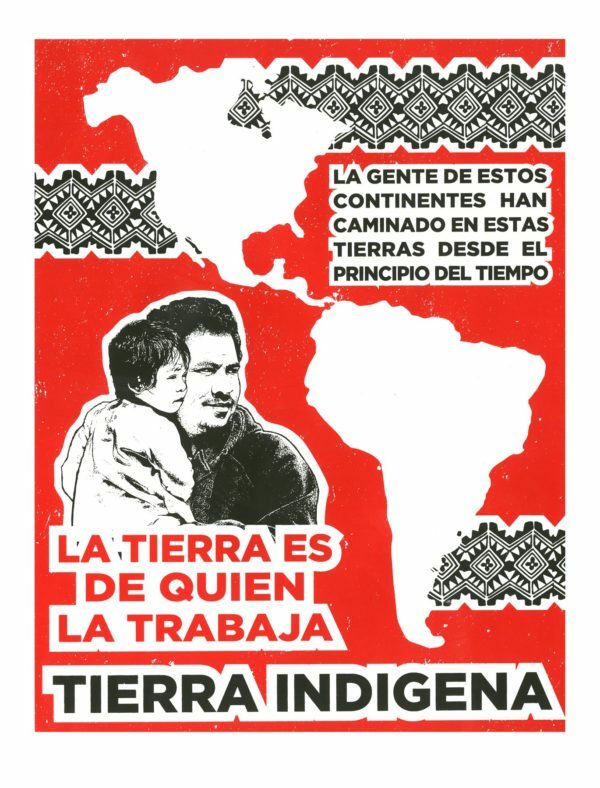 The history of these collaborations starts with Tierra y Libertad Organization (TYLO) in 2007, when we supported their organizing against immigrations raids by designing posters for their "Stop the Raids/Alto a las Redadas" campaign. 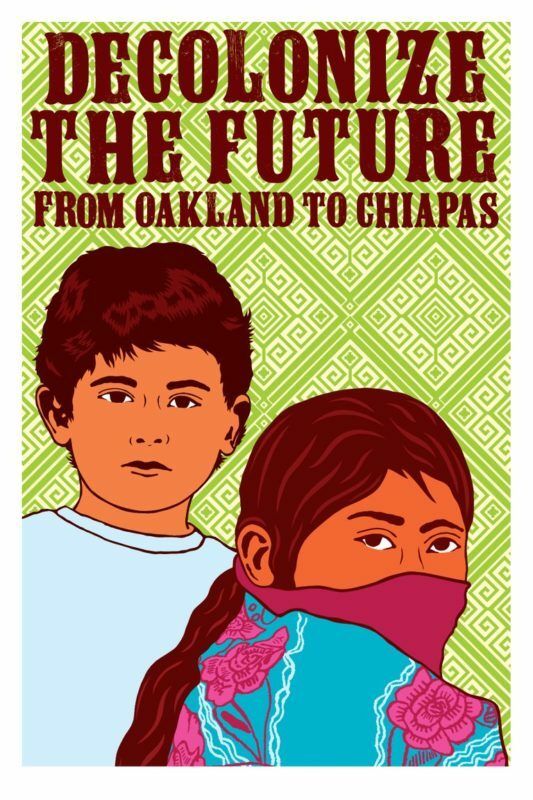 This continued in the spring of 2010 working with Puente Movement to send over 3,000 handmade screen printed posters for the resistance and non-compliance with SB1070 marches and rallies. Most recently, in 2011, working with No More Deaths on the "Stop the Culture of Cruelty" campaign by designing the cover of their ground breaking report on the abuses of immigrants by the Border Patrol (Immigration and Custom Enforcement). The first trip to Arizona was a way for us to introduce ourselves to the community and make connections with folks, this included meeting with each of the organizations and figuring how we can plug in to the work they are doing. The real fun part was the art making, we had an opportunity to hold some screen printing workshops in Tucson and Phoenix along with slide presentations to show everyone the posters we make. Left: Melanie with her dad at the workshop pulling a screen printed poster. Right: Screen printing workshop at Scrapy’s in Tucson. 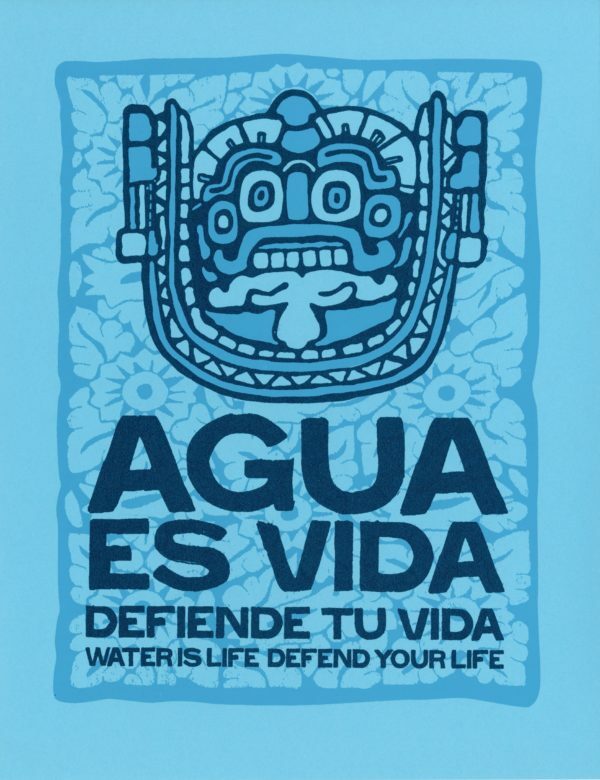 The first day in Tucson we met with No More Deaths, an amazing organization whose work focuses on the border area around Nogales, some of the work they do is to take water out to the paths where people are known to cross the desert as they are making their way to the US. They told us about all the awesome work they do and plans they have in the border area helping people who have recently crossed through the desert and are in need of help. Later that night we had the opportunity to set up at Skrappy’s, a youth space being run by Rebel Arte Collective, where we got to present a slide show and have a screen printing demonstrations, we explained the screen printing process and everyone had the opportunity to print a poster and take it home. It was a nice way to be introduced to youth in the programs we have heard so much about and talk to them about the work they are doing in the community and how they have worked to defend Raza/Mexican American Studies Program. Even Melanie’s dad drove into Arizona (his home state) from LA to join us and he brought some of her family from the area to the workshop. Left: A couple workshop participants holding a poster they just printed. Right: Melanie sharing some of the posters we’ve made. Left: Melanie showing a workshop participant from TYLO how to print. Right: Poster that we’re printed by participants drying on the floor. The second day we went to TYLO’s house where they treated us to breakfast and we were introduced to some of the members and got a tour of the house and garden. We were there for the start of the "Green Jobs" classes being held at the space where youth are getting trained to become part of the green jobs economy. Our host and friend, Nicole, took us on a short tour of Tucson, and we got to check out a cool cafe on 4th street, A Mountain and some local art stores where we found some cool momentos. Later that day we got to meet with a group of members from TYLO and talk with them about the issues they are facing, everything from trying to block liquor stores near schools, fighting for better school lunches, access to grocery stores with good produce to the upkeep of their gardens. It was a real eye opening experience to hear about the issues they face and how they are standing together to fight and take care of their community through their Barrio Sustainability work. Left: Students in the Green Jobs class. Right: One of many murals in the alley behind the TYLO house. Left: Another of the TYLO murals. Right: Meeting with members from TYLO talking about the issues in their community. The third day was a little more relaxed. We had time to visit some artists in the Tucson Community. We stopped by the Gloo Factory, a screen printing shop where we met Dwight Metzger who runs the place and Mia who helps print, they were hard at work printing giant lawn signs for Roberto Grijalva campaign when we arrived and we hung out as they cleaned up and they showed us some of the work they do, like some Judy Barry t-shirts that had just been printed. We wanted to leave a little something for their shop and gave them some posters and they gave us some left over rubylith for cutting stencils. Visiting other screen printing studios is always a lot of fun, I always walk away learning something and whether it’s something big or small, I learn something that can be applied back home in our studio. Left: Dwight cleaning up after finishing printing the first color of the lawn signs. Right: Mia setting up the second screen for the lawn signs. Later that day we made another studio visit that we were super excited about, we met Carlos Valenzuela and Alex Garza who have focused on making public art in their community. We had noticed their beautiful tile murals through out the city along with the giant steel papel picado artwork on the Cesar Chavez overpass we crossed when driving to the TYLO house, it seemed that when ever we asked about a piece we saw their names kept coming up. We were able to check out their studio and see the giant concrete pieces they were working on, they explained their process for making the molds and how they pour and cure the pieces. It was really exciting to see how they do what they do, but it was especially refreshing to know how open they were with sharing their process and to hear them talk about working for community and how committed they are to working with youth and teaching them about art making. We had so much fun that afternoon and hope we can stop by next time we’re in town. Left: Carlos and Alex in their studio explaining their process. Right: A few examples of the concrete pieces they’ve produced. Left: The Cesar Chavez bridge in Tucscon. Right: Hanging out with Carlos and Alex in their studio. Our fourth day started in Phoenix after a late night drive from Tucson the day before, this day we set up at the Puente Movement office for a slideshow and a print demonstration. Puente shared a presentation about the political climate in Arizona and the history that had led to things like SB 1070 and the eradication of Raza/Mexican American Studies as well as the future of the state as the majority of the population become Latin@. Although we had met some of the members in the past this was the first time we had been able to hang out with so many of the organizations’ members and share with them the artwork we make how we collaborate with other organizations. We had a lot of fun at Puente, the screen printing workshop was super productive, after showing everyone how to pull a screen print, we went into high production mode and printed about 400 posters in preparation for the July 28th No Papers, No Fear, Dignity is Here action. It was a long hard day of work, but at the end of the day we headed to the park for carne asada with the whole Puente Family, it was a real treat to get to hang out with everyone that evening. Lef: Puente members screen printing some posters. Right: Melanie showing members how to print some posters. Left: Melanie pulling a screen print to show other how to make poster. Right: Puente members learning to print posters. On our final day in Arizona it was decided that we would do another screen printing workshop, we headed to the art store in town and found some screens, inks, transparent film and paper. This time people made their own designs cutting rubylith and drawing with ink onto film and to expose the screens we used the sun. This day was really great to see people produce a screen print from beginning to end, brainstorming ideas, making sketches and inking their drawings showing everyone how to expose a screen and then print their images. Workshop participants showing off some of the prints that were printed that day. Left: Getting ready to expose screen using the sun. Right: Printing "We Will Not Comply" posters using the screen we exposed in the sun. Left: Puente member cutting a rubylith based on one of the many stencils they’ve produced. Center: Carlos showing off the rubylith he cut that day. Right: Carlos showing off the screen he just exposed. Left: Coating a screen with Sam who was volunteering at Puente and asked about any screen printing workshop only to find out there was one happeing there that day. Sam helped so much that day, from going out to cleaning screens to helping others and sharing all her supplies. Right: Armando cutting a ruby from one of his designs, he was also a big help that day, sharing supplies and helping others learn to print. Left: Lisa printing a design she created in the workshop. Center: Lisa showing off her print. Right: JoJo with one one of the bandanas she just printed. After leaving Arizona we were really happy to see how the skills we left were used, the artist in Phoenix continued producing more screen prints in addition to the spray painted stencil posters they have been producing. Melanie also worked with Puente artist to start a Facebook campaign to raise funds to create banners, posters and puppets for the July 28th action, it was exciting to see how we can contribute to a community of artists and expand their artist tool box. As we prepare for our next trip we’re thinking about how we can continue to leave skills with artists in the Arizona community that can help expand the type of artwork that they produce. We are grateful to National Association for Latino Art and Culture (NALAC) and The Culture Strike with out whose support this project would not be possible.